Nail fungus isn't pretty, and getting rid of it can be a challenge. However, nail infections won't go away by themselves, so an effective treatment is required. The medical name for nail fungus is onychomycosis. There are several types of fungus that can infect nails. The most common type is Trichophyton rubrum. The infection often starts out as a small, discolored spot which slowly spreads to affect the whole nail. Infected nails look whitish, yellow, or brownish, or may have a collection of small, powdery spots. Nails are usually thickened and/or roughened. The edge of the nail or the area under the nail tip may seem crumbly. Sometimes, the nail will separate or peel away from the nail bed. The infection is sometimes, but not always, painful. There may also be a bad smell to the nail and the area around it. One type of infection, caused by a yeast called Candida, can affect not just the nail, but the entire fingertip or toe. The finger or toe may look bulbous and the area around the nail may be red and swollen. 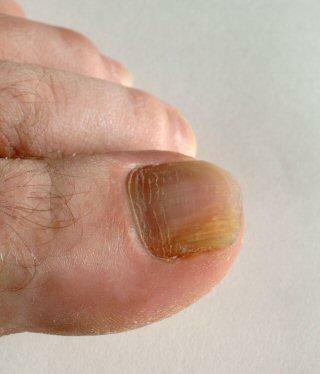 The fungi that infect fingernails and toenails like to live in moist, warm places. That includes shower stalls, locker room floors, and the area around swimming pools. Toenails tend to get infected more often than fingernails. That's because walking around on wet floors exposes the nails to fungus, and then wearing socks and shoes creates a nice, warm environment for the fungus to thrive. Fingernails are usually exposed to air and allowed to dry thoroughly, which makes it less likely for the fungus to develop. Anyone can get a nail infection. According to the University of Alabama at Birmingham, 11 million Americans suffer from this condition. It's more common in men than women, and more common in adults than children. Association of American Family Physicians says that children rarely get onychomycosis. Keep nails short and clean. Dry hands and especially feet thoroughly after bathing. Wear shoes that "breathe," such as running shoes with a mesh top. Wear flip-flops or water shoes in communal showers. Use an antifungal powder or foot spray (available at the drugstore). If you get manicures and pedicures, make sure the salon is clean and that they sterilize their instruments (or, preferably, bring your own sanitized tools and nail polish). If you have an infected nail, wash your hands after touching it so you don't spread the infection to other nails. Antifungal creams from the drugstore can sometimes cure nail problems, or your doctor may prescribe a liquid or cream. However, these topical treatments often don't work. The fungus lives in the nail and in the skin beneath it, and the medicine would have to penetrate through the nail itself to kill the infection. For this reason, topical treatments are usually recommended only for people who have mild infections or who can't take the systemic medicines. Several antifungal medicines are available in pill form. Your doctor may prescribe itraconazole (brand name: Sporanox), fluconazole (Diflucan), terbinafine (Lamisil), or another drug. All of these can have side effects or cause complications, especially when used with other medicines, so your doctor may want to do certain tests or monitor you closely while you are using them. Not everyone can use the systemic medicines. Sporanox is not safe in people who have heart failure. Lamisil is not safe for people with liver or kidney problems. Diflucan can also occasionally cause liver problems and must be used with caution in people with certain heart problems. Home remedies may help a little, but for even moderate infections you'll need a doctor's care. Stay on top of the symptoms in order to prevent spreading. By visiting your podiatrist regularly, you can take a proactive stance to avoiding this itchy, sometimes painful condition.